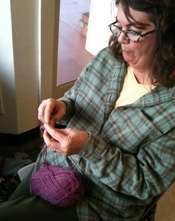 It is truly inspiring to see all of you get over the learning curve “hump” and to enjoy a little knitting time together today. The Sweatshirt Pocket – You all did this swimmingly. Let me know if you have any follow-up questions on this. 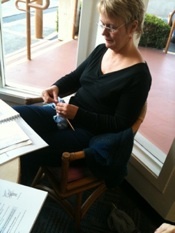 The Bar Increase is the simple increase that we make by knitting into the front and the back of the same stitch. Click here YouTube – Knit One Front & Back (k1f&b) to view the video that will review this technique for you. I will go over homework for this below. Stripes – we reviewed how to put the stockinette stripe and purl strip in your sampler. We will demo the Raised strip in class next week. The Raglan Seamline Decrease was introduced. Click to see the short videos to remind you of the two decrease techniques used in it – Knit 2 together (K2 tog) YouTube – How to Knit Decreases – Knit 2 Together – K2tog and Slip Slip Knit (SSK) YouTube – How to Knit Decreases – SSK aka slip slip knit decrease. 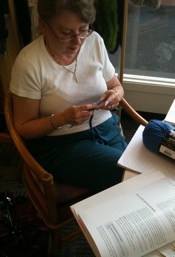 Knitted Cord aka the i-cord, see video here YouTube – How to Knit – Making an i-cord for review. And lastly, the Knitted Belt. Again, please contact me with any questions. But it looked like you all did great with the i-cord and belt techniques. Pictures demonstrating it! For the homework… Have fun with it! Read/review the Bar Increase section on pages 37 – 39. To begin knitting this, start with the directions at the top of the page on page 39, to set up your stitch markers. 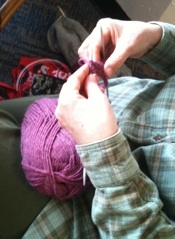 The follow the direction knitting one round and working increases A, B, and C at stitch markers as directed , followed by a round of straight knitting. Repeat these two rounds 3 times. Remember the definition of how to do Increase A, B and C are under METHOD on the previous page 38. After you have accomplished the Bar Increases, STOP, breathe and give yourself a number of pats on the back; better yet grab your sampler and show it off to the nearest friend! Once you have calmed down from that feat, move onto the Stripes and Knit one round knit stripe, then knit three rounds in your lighter sampler yarn then knit the Purl stripe in your other colored yarn, remembering to knit the first round of that, then to purl! Stop breathe! 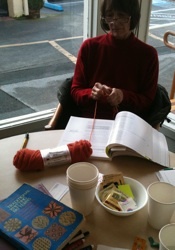 You are done with the knitted part of your homework – although, if you are inspired and feeling spunky, go ahead! We will catch up with you. We will do the Raised Stripe in class next week along with the Raglan Seamline Decreases and the varied knitted castoffs, see videos here – Binding Off in Knit Row – YouTube – HOW TO KNIT: BINDING OFF KNIT VIDEO , Binding Off in Purl Row – YouTube – HOW TO KNIT: BINDING OFF PURL VIDEO , Binding Off in Ribbing Row – YouTube – BINDING OFF RIBBING. Including the afterthought pocket of course! Again, to take advantage of the limited class time we have, if you all could view the short videos on the decreases (see above) and the castoffs here that would be great. And if you have a moment please re-read the section on the Raglan Seamline Decreases Pages 42 to 45.